This wrist watch was converted from pocket watch. Original movement OMEGA, swiss made, 15 jewels. The movement is with bimetallic compensation balance and blue breguet-spring. This serial number dates movement Omega to the year 1946. Mechanism has been recently qualitatively serviced (Cleared and Oiled to ensure it winds and sets smoothly while keeping accurate time). Omega pocket watch movement has been skeletonized and engraved nowadays presently by our artist-engraver. On the front and back sides of the movement You can see HIGHEST QUALITY ENGRAVING made under microscope. This is very painstaking, laborious, handmade requiring certain skills. As a result of this work, our Clients receive Super exclusive products. Dial: (non Omega) was made in 2018. Watch Case: New Silver case (non Omega) was made specially for this beautiful, vintage pocket watch movement in Art studio in 2018. A marriage watch -basically it is a pocket watch converted into a wristwatch, combining an original movement with other original parts and/or non-original parts(for example: new watch case, crown, new watch dial, hands, new watch glass). Usually movements from Swiss pocket watches are in good condition even if movement was made a hundred year ago, but some parts of movement, such as: hands, crown, watch glass, dial, case, can be lost or demaged. Demaged parts change to new modern watch parts to give new life for old vintage antique Swiss movements. TENNESSEE State and CALIFORNIA State of. Antique watches generally experience an error of up to 5-7 minutes a day. Any accuracy of +/-5 minutes is very good. The case was made from a good silver , the silver case is weighed on the scales, the scales are Not included in the lot. YOU GET WATCH with WATCH STRAP 1 piece. You receive watches Without documents of Omega company, supplied without certificate to authenticity. Plastic stand for watch is not included in the lot. Swiss watches have always been considered the best in the world. At hand of the owner of Swiss watches tell more than himself it wants. Style, status, business card of man-is a Swiss watch. More than 150 years Omega's watch masterpieces have an impeccable reputation for being the benchmark of excellence and quality of Swiss watchmaking. Omega company has an extraordinary history. For years, people created an amazing image of the company: tireless watchmakers, talented designers, enterpreneurs, and, of course, all employees, whose dedicated to the company and love of Omega's products made company Omega famous throughout the world. Creation legendary brand Omega, her rise to fame has always been rich in achievements. Omega's founder Louis Brandt was born May 13, 1825 in La Brevine, Switzerland. First workshop of for assembling pocket watches 23-year-old Louis Brandt opened in Swiss town of La Chaux-de-Fonds. In 1877 Louis Brandt took his son Louis-Paul as a companion to his already thriving business, which was henceforth called Luis Brandt & Fils. In 1879 Louis-Paul, together with his brother Cesar, moved company in Biel. Name Omega was first used in 1894. The last letter in the Greek alphabet symbol symbolized perfection and success in the attainment of a task. Since 1900, the largest Swiss watch factory renamed Societe anonyme Louis Brandt & Frere-Omega Watch Co. In 1903 the company moved to four sons of Louis-Paul and Cesar. In 1925 the company received the Grand Prix Exhibition of Decorative in Paris. History of discoveries and achievements Omega continues but it is clear that name of the Greek letter signifying perfection rightly given to watches of this company. Keep your vintage watches away from magnets because strong magnetic fields may affect the accuracy of your watch since some vintage watches were made with iron based components in the movement. Antique watches should not beaten or dropped so as not to damage the mechanism. Excluding some countries (please, see excludes). 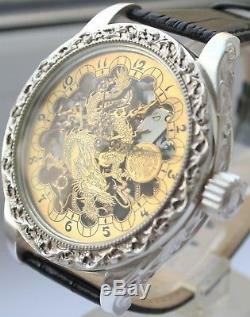 Vintage watches are very delicate product and will be packed to the highest degree in order to avoid unwanted damage. We do not send items to. After 4 days the piece will be re-listed and Unpaid case will be opened. Our goal is to make You a satisfied Customer and we will do our best to make this happened. We are here to help and we count on your satisfaction with our products. The item "Man's Swiss Pocket Watch Omega Movement 1946's SKELETON Fire Dragon, Silver Case" is in sale since Thursday, January 3, 2019. This item is in the category "Jewelry & Watches\Watches, Parts & Accessories\Wristwatches". The seller is "keepertime" and is located in Europe. This item can be shipped worldwide.